Browse: Home / 2015 / July / 20 / OEMG Releases the Community Solutions Media Library Right Here on Our Website! The Occupy Eugene Media Group has been working on an archive of photos, videos, and podcasts that is now finally available. You can go directly to the Community Solutions Media Library at http://occupyeugenemedia.org/mediagroup/community-solutions-media/. The library is a table of contents full of media. We have more work to do but you can find a considerable amount of media there, beginning with Rob Sydor’s photos of Occupy Eugene’s first General Assembly September 29, 2011 and going all the way to our current efforts with Eugene’s Avant Gardeners, the Ninth Ward Protest Camp, and the various sanctioned camps that we have now. Twenty Producers have contributed so far with more to come. We will be continuing to add media to the library and we hope that anyone who has relevant photos or videos will share them with us, so we can add them to the library also. You can put your photos on our Occupy Eugene Photos Facebook page, email Jana at occupyall1@gmail.com or call 541-606-2025 for more information. Please comment on the library pages, so that we can all become a part of the OE library’s narrative, describing the Occupation in Eugene and all the good work that it has inspired. We hope for the library to be a platform for Occupiers to share media about their efforts and a place where others can find put about our good work easily. 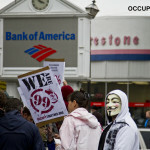 Please feel free to make a donation to Occupy Eugene or our media group. Anything helps and we promise to use it for good. We also encourage you to volunteer your time. We greatly appreciate any offer to help with recording, editing, or data input. We have a computer for use as well as camera equipment, thanks to the Wayne Morse Project Grant!